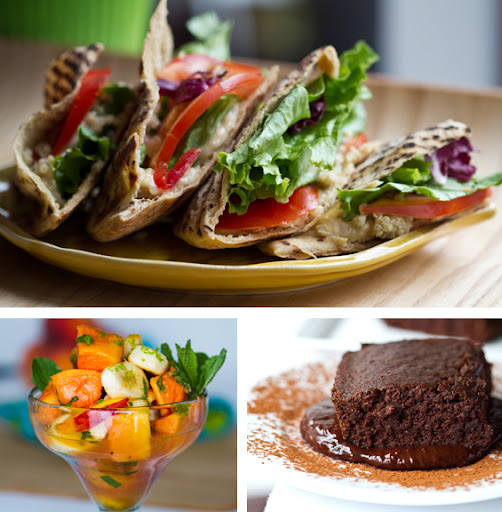 Vegan Recipe Round-Up for a Meatless Monday! In case you missed these delicious bites last week - here is my Family Kitchen Vegan Recipe Round-Up. Six new recipes not to miss! And actually, this would make a perfect Meatless Monday menu!.. 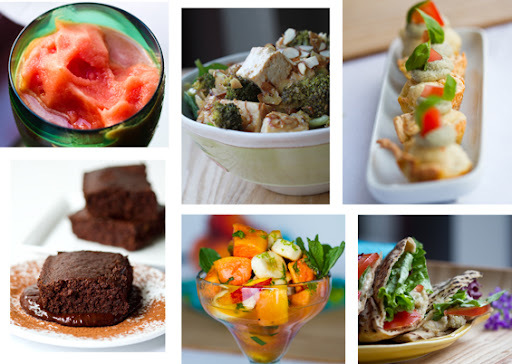 Don't miss these delicious vegan dishes I shared on Babble.com's Family Kitchen this week! A lime-infused spin on my classic Watermelon Frosty recipe. A surprisingly healthy - rich and decadent - chocolate cake that's totally vegan. The fat free chocolate cake recipe is from Dr.Neal Barnard's new book. And it's fabulous! (Fabulously fat free, wow.) A cool history lesson to go with too. I am in love with this light and refreshing - totally energizing morning fruit cup. Zesty lime combines with creamy papaya and caramel flavored maple syrup. A fun savory appetizer that almost reminds you of a savory mini cupcake! I used my luscious Summer Thyme Hummus to craft this perfect for a picnic pita recipe. I shared this with my parents for a weekday lunch and they loved it. Simple. Satisfying. A satisfying bowl filled with good for you foods - tofu cubes fluffy yet tender to bite. And bites of broccoli, all fuming with smoky, white miso, savory sweet flavors.